1. 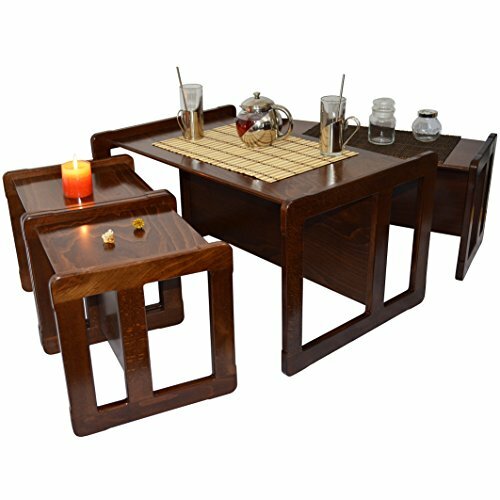 Adult Nest of Four Coffee Tables (One Table With Top Height of 38 cm and Three tables With Top Height of 32 cm). 2. Large Children's Bench with High Seat (Seat Height 32 cm) or Large Children's Bench with Low Seat (Seat Height 20 cm). 3. Small Children's Bench with High Seat (Seat Height 21 cm) or Small Children's Bench with Low Seat (Seat Height 14 cm). 4. 2 x Small Children's Chair with High Seat (Seat Height 21 cm) or 2 x Small Children's Chair with Low Seat (Seat Height 14 cm). 5. 2 x Small Children's Table (Table Top Height 32 cm). 6. 1 x Small Children's Table (Table Top Height 32 cm). This llsting is for 3 in 1 Adults Multifunctional Nest of Coffee Tables Set of 4 or Childrens Multifunctional Furniture Set of 4, Two Small Chairs or Tables and One Small Bench or Table and One Large Bench or Table Beech Wood, Dark Stained. These multifunctional items have the frames made from solid beech wood and the table top made from beech ply wood. They are varnished with child safe water based varnish.